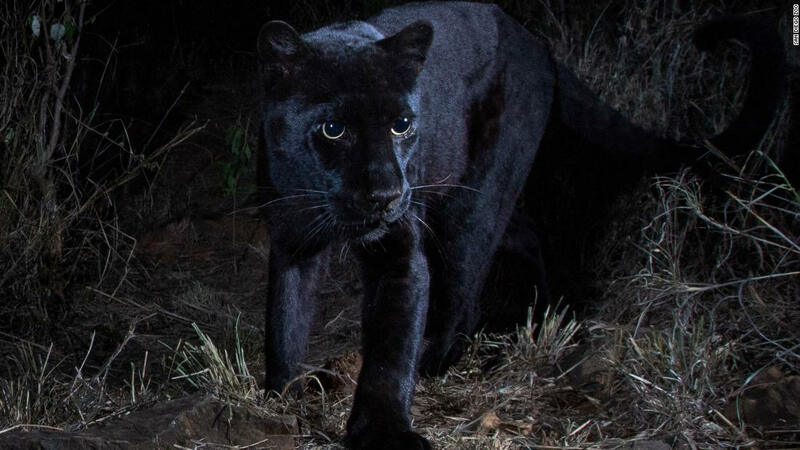 An incredibly rare black leopard has been photographed in Kenya, marking the first definitive proof of the creature's existence in Africa in over a century. Nick Pilfold of San Diego Zoo Global's Institute for Conservation Research photographed the cat after hearing of its presence in a Kenyan conservancy and setting a series of camera traps. Officially, the animal is known as a melanistic leopard. Melanism is the result of a gene that causes a surplus of pigment in the skin or hair of an animal so that it appears black. Black leopards, sometimes referred to as black panthers, have reportedly been seen in East Africa for decades but scientific confirmation of their presence on the continent remains rare. In fact, the previous latest confirmed sighting comes from a photograph taken in Ethiopia in 1909. "Almost everyone has a story about seeing one, it's such a mythical thing," said Pilfold. About 11% of all leopards are thought to be melanistic, but the vast majority live in southeast Asia where their black coloring provides additional camouflage in the shaded habitat. Pilfold adds that it's curious that the fictional country of Wakanda, home of the superhero Black Panther, is located in East Africa, fairly close to Kenya.